If you love fine foods and enjoy travelling, visiting some of the monasteries and convents scattered across Andalucía is a must. Not only do you see some of the best of Spain, but you get to enjoy some of the best delicacies to be found anywhere. With airline tickets widely available, you can be in Spain in a few hours - and straight into the good life! 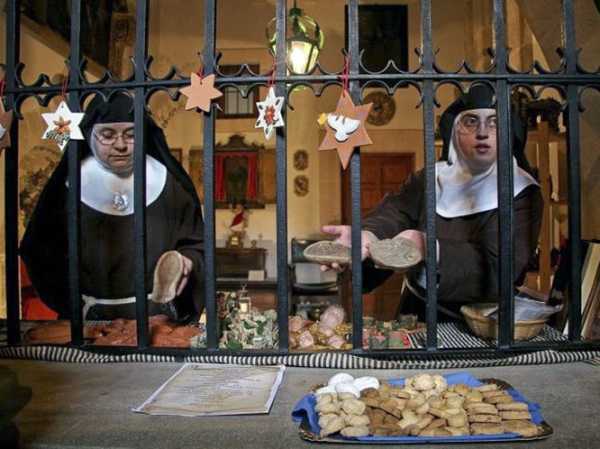 Some Convents have their particular edible specialities available all year – so if you are on the hunt for a local specialities, ask local shopkeepers for "dulces de convento" – and you’ll be sent in the direction of the nearest Convent or Monastery. Most of these buildings are not signposted, so once you have found the right place, you may well be greeted with “Ave Maria purisima” – which means Hail Virgin Mary, and in response you should reply “Sin pecado concebrida” – conceived without sin. With formal greetings out of the way, you can ask about the cakes, biscuits and sweets! You may find that there is a shopfront, with the cakes and sweets displayed, or within the wall of the building, you might see an alcove, with a turntable arrangement. Once you have looked at what's available, and made your choice, you place your money on the turntable, and it disappears into the building. Back out will come your goodies and it's usual for your change to be returned too. You may not see the person who has sent the items through, since many of these establishments are closed orders, where contact with the outside world (i.e you) is not possible. Here are three particularly good places to sample some delicious morsels – and see Andalucía at the same time! Monasterio de San Bernardo sell pretty selection boxes of little cakes during the year. Local people usually buy a box and head for their favourite café, and enjoy their pastries with a cup of coffee. At Christmas time things get busy with special Christmas sweetmeats, with a focus on almonds, nuts, honey and sweet custards in the lightest of pastry bases. 1. Monasterio Jeronimo de Santa Paula specialises and wonderful conserves – they are known for their fig, orange and quince jams. There is also a museum to see and the opening times are 10.30am– 12.30pm and then 4.30-6.30pm – closed on Mondays. 2. Convento de Santa Ines also in Seville, was founded by a Spanish noblewoman, Dona Mara Coronel, who was pursued by King Pedro The Cruel. In an effort to get away from him, she disfigured herself and founded the Convent. t's famous for its beautiful sweet egg cakes – simply divine. If you want a tour of Andulacia, there are lots of cheap flights to Malaga, which is a fabulous city in its own rights. Once your flight has touched down, it's about 40 minutes train ride to the centre of Malaga. After a couple of days of city life on the coastline, you can pick up the fast train to Seville from Malaga Main Station, or pick up a coach to Granada. Seville and Granada are breathtakingly beautiful cities and foodies will love the tapas and pastries available on every corner, open until the wee hours - perfect with a glass of sherry!